The Hidden Lake Log Ottoman is made from 4-5" diameter Northern White Cedar logs that have been sanded smooth. 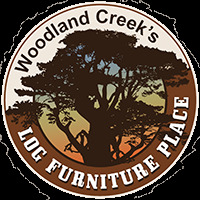 The rustic ottoman may be left unfinished so you can finish it as desired, or choose from our clear or honey pine finishes. This Hidden Lake Log Ottoman has a simple, clean peeled, classic log look that allows it to blend with most any rustic decor. Use it in your rustic lodge, log cabin, country cottage, or lakeside retreat.